The Forever Ship (2017. 437 pages) is the last book in a trilogy, having been preceded by The Fire Sermon and The Map of Bones. The trilogy was written by Francesca Haig. This being the third in the series, the review will be full of spoiler for books one and two. The series is set in a post-apocalyptic world where a nuclear exchange not only altered the land, it also altered something fundamental in human DNA which caused all births to be made up of twins, an Alpha and an Omega. The Alpha twin is physically perfect, whereas the Omega is always born with some form of disability. The surviving society places the Alphas in a dominant position to the Omegas. The Alphas live a life of comparative luxury, whereas the Omega are driven to the fringes of society and most live subsistence lives. As much as the Alphas would like to remove the Omega’s they cannot, as the twinning process fundamentally joins the two together. Kill either twin and both die. Book one and two detailed Cass’s fight for the rights of the Omegas to live a life of equality. Unfortunately, for her, one of the great architects of the Omega final solution is her own brother. As an Omega, Cass is different but her difference is not on the outside, Cass is a seer, someone who can see the future and what she sees is the return of another nuclear blast, aimed at the one last area of human freedom, Elsewhere. So, book three picks up with the Alphas having acquired a set of working warheads with the desire to crush not only the Omega resistance, but also the recently located Elsewhere. The book turned out to be other than what I was expecting. Usually trilogy’s consist of the first book setting the environment and all the players within, the second tends to be a bit slower as the participants are manoeuvred into position for the explosive end in the third book. This is not what has happened throughout the trilogy. 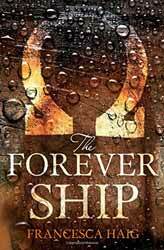 There is a marked lack of action in The Forever Ship compared to the first two books. There are only two action sequences and these are small affairs given that the fate of the planet is at stake. There is other action alluded to, but this all happens out of sight of the main characters so we only get scant information. Because the book defied expectations I thought the first half was very slow, consisting mostly of Cass talking about her brother Zach or having others talk about him and his relationship to Cass. It took a while for the penny to drop that the whole trilogy had been about the twins relationship, therefore what the third book needed to resolve was not the saving or losing the world in a wave of flashy battle scenes but this central, intimate bond. This then creates both a strength and weakness for the book. If, as a reader, you were invested in Cass then this will be a satisfying end to the story. I thought the ending was handled exceptionally well, even though it was bitter sweet it was also the only logical way for it to end. If, however you have come looking for less substance and more literary pyrotechnics, I think you going to be a little disappointed.